Amazon is, in fact, a big retail search engine, so when potential book buyers start looking for a new book to read, they very often begin by searching. Amazon product searches are based on Amazon keywords. Therefore, you want your book to appear when people use a search term that is associated with your book. This will only happen though if you do your Amazon keyword research and select the best seven Amazon keywords for your book. 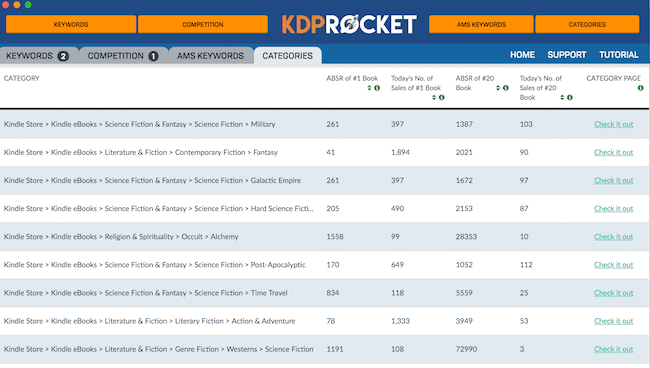 Where do you start with Amazon keywords for books and Kindle ebooks? Firstly, let’s go back one step. The two categories (genres) you have chosen are crucial and need to be as narrowly focused as possible. In a previous post, I explained how to add search phrases to categories, and by using this method, it is possible to have your book listed in an additional two or three finer focused categories. Once that is done, it’s time to add your seven keywords or long tail keyword phrases. Yes, you can select either one specific keyword, or you can use a short phrase for each of your seven keywords. Think about the topics, themes, geographical settings and period in your book, and start making a list of the possibilities. Then try your seed keyword or phrases in Google, to begin with. Why? Because, first you can check the search volume at the top of the page, and then at the bottom of the first page of search results, Google gives you a list of related searches, so you can note more possibilities for your keyword research list. In my case, as you can see from the image below, I finally selected ‘cold war’ as one of my potential keywords. Once you have a list of possibilities, go back to Amazon. BUT, don’t begin your search there. You need to navigate to one of your main categories, and further down if you have narrowed your category. My book is listed under one category of Biographies & Memoirs and in the sub-category of Historical. Once there, I can see the total number of books that are competitive to mine. So, not bad. Only 23.5K. If this number is very high, you really need to consider refining your category selections. Now, in the search box, start to enter your keyword, but don’t hit enter. As you type, Amazon provides you with a drop-down list of actual searches, or buyer keywords that people have made, so this information is absolutely worth noting, and for getting more relevant keyword ideas. This is the result of the start of my keyword. 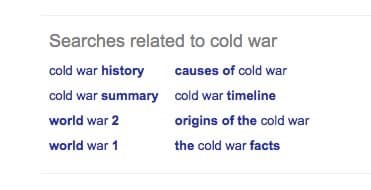 Looking down the list I can see that my keyword phrase ‘cold war’ has been used by Amazon customers, so this is very good news. Unfortunately, you don’t get Amazon search volume. If you really want this information you will need to pay for a commercial Amazon keyword tool. However, I have never really found the need. That my keyword is listed is a very good sign that it is potentially a great keyword. Next, select your keyword, and in my case here it is, ‘cold war’, and hit enter to check on how competitive the keyword will be. I would prefer a slightly higher number than 187, but it’s far better than 200k! If your keyword search returns under 1,000, it will increase your chances of your book being discovered in Amazon search results. A number greater than 1,000 means that your keyword will be up against a lot of competition, and it may struggle to appear in a high position. Once you have selected your keyword, go to your KDP dashboard and change the keyword in your book’s ‘Edit Details’ screen, and republish. Wait a day or two, and check your new keyword, but again, first make sure you are searching in your category. So, was my research and change of a keyword worthwhile? Yes! 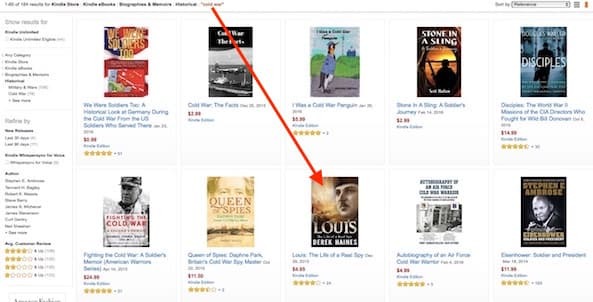 My new Amazon keyword has worked for me, and my book is appearing at number 8, which means it will appear on the very first search screen for my keyword. That is exactly what a good keyword should do. Repeat the same process for your other six keywords, and then from time to time, check them again to see if they are still performing well. If the results are not as good as you would like for one of your keywords, go back to your list of keywords from your research and start hunting for a new one to replace it. You could also try using semantic keywords to find more possibilities. Over time, you will have a list of seven strong Amazon keywords that will help readers find your books, and give you a far better chance of increasing your book sales. 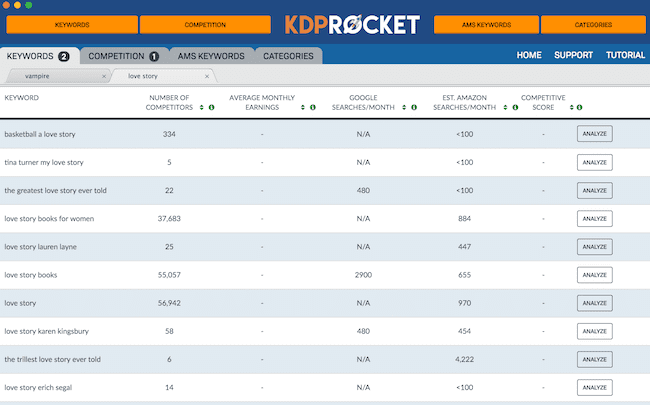 If you have a lot of titles and want to speed up your keyword research with real-time data, you might want to consider KDP Rocket, which is a high-performance pro tool for Amazon book keywords. You can access the Amazon database to find the best seven keywords and two book categories for all your titles. I love this article! I wonder if this technique will work with other online retailers like B&N, Smashwords, etc.? When I go to my category, and enter a keyword and space to see the autocomplete, it only shows generic results. If I choose one of the options and hit return, it doesn’t appear like it does in your screenshots – it completely wipes whatever category I had selected and displays results as if I had entered those words from scratch on Amazon.co.uk. So I don’t understand this process I’m afraid. Another issue I found in the related article about choosing hidden categories, was that the categories I had selected from those available in the tree in KDP, were different to what was available on the actual Amazon website. This is an extremely confusing process, and it’s delayed me getting my book out today. After reading a few articles, I am still fairly clueless what I am supposed to choose for my keywords. The advice conflicts with each other. Why can’t someone just write a guide of do’s and don’ts with some examples. We’re not telepaths, and after spending a year on a book, these last minute hurdles are soul destroying. I empathise with your frustration. Choosing categories and keywords is not a precise science, as it is very similar to SEO practices. Your selections are used by Amazon search algorithms, and like Google, these are a secret, so no one knows exactly how they work. All you can do is choose the best you can, see how they work, and keep trying if you don’t get high search results. Also, your categories and keywords will work differently on Amazon UK and Amazon US. So check both. Unfortunately, there is no definitive guide, because algorithms change almost every day, so it is a matter of continual trial and error. Hi Tim. You need to use Chrome, Firefox or Safari on a desktop or laptop to get the drop-down list. If it doesn’t work, try clearing your browser cache. I’ve just noticed that it works if I use the search toolbar under “books”, but not if I search on any of the sub-categories, and not at all in the “kindle e-books” section. I use Firefox on a laptop and have also cleared my cache by the way. Do you think checking my keywords in the “books” search bar will still give me a good overall idea of what people are searching for and whether my keywords are strong? Or is it better to check them under the sub-categories? I think there must be a setting on my laptop that is limiting my searches to just the broadest categories. Amazon might have changed something on its site, or perhaps there’s a glitch. I just checked, and yes, only books seem to be working at the moment. So, yes, use the books section for now. Yes, you can. As often as you like. I’ve got an important question: when I look at Google search volumes, what would be the optimal range for my keywords? I know it’s tough to position myself when the number is too big, but on the other hand, few search results mean… no one will use this particular phrase, so it doesn’t seem efficient either.